It is official, Summer 2017 is now upon us! 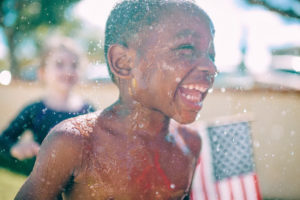 Children are out of school or in remission and are likely spending more time outside; playing with friends, splashing around in the pool, or adventuring outdoors with a local summer camp. Whatever the case may be, your child and family’s exposure to sun is at an all-time high. Although some may feel that overcoming a mild sunburn may not be that much of a concern, we’re here to warn you that the U.S. Center for Disease Control and Prevention sites that a serious sunburn can increase your risk of getting skin cancer in the future. As with most things in life, some simple tips and guidelines can easily be implemented to help keep your #TroubleMaker safe. Let’s start from the beginning. We’ve all seen these acronyms on sun protection products, but what do they mean? It’s really quite simple. What they are referring to are the three kinds of ultraviolet rays that comprise sunlight. UVC- are the most dangerous rays, but are blocked by our ozone layer. As a result, they will never reach our skin. UVA- These are the most common rays that penetrate our ozone layer, leading to skin cancer and skin aging. UVB- These are also penetrable rays. They cause sunburn and may contribute to skin cancer. SPF is another popular word that we hear tossed around, especially during the summer months. Very simply put, it stands for Sun Protection Factor. What it measures is the amount of time you can theoretically be in the sun before getting a sunburn. So, if you apply a SPF 15 to your skin, you should be able to stay in the sun 15 times longer, or 150 minutes, without burning. Of course, this all depends on the type of skin you have and the type of product you’re using. Although we’re all more aware of sun safety during the summer months, WebMD urges us to use sunscreen, preferably SPF 30, all year round. Also, they urge us to choose products that are labeled “broad spectrum”, which offers protection against UVA and UVB rays. Johns Hopkins Medicine also explains that since the sun’s rays are strongest between 10 a.m. and 4 p.m., that direct sunlight should try to be avoided during that time frame. During these peek hours (10 a.m. -4 p.m.), have your children play indoors or in the shade. Since sun block doesn’t activate the instant it is placed on the skin, WebMD recommends applying it 15 minutes prior to going outside. Even on overcast or cooler days, UVB and UVA rays are still present. * Reapply sunscreen at least every 60-80 minutes, or perhaps more often if your child is sweating and/or swimming. Staying covered is a great way to protect against sun. Many children’s bathing suits come in longer sleeve and longer shorts options. Hats, especially the ones with a neck flap and wide brims, are great gear to wear in the sun. Cotton and linen materials are also quite nice and comfortable to wear, as these fabrics “breathe”. *Popular clothier, Roxy, has some AWESOME outdoor summer wear for children. Their lineup includes outfits that are constructed with UPF 50 (Ultraviolet Protection Factor) fabrics. Since sun exposure may damage corneas, sunglasses are essential. Once again, look for labeling that advertises 100 UV protection. * There are also contact lenses on the market that offer UV protection as well. And, per usual… tanning beds are terrible for your skin! Just don’t use them. Not that we think you’re going to allow your child to fake-and-bake, we’re offering this summer sun protection tip exclusively for you Momma & Papa bears. But most importantly, have fun, be safe, stay protected, and enjoy the season!